During a series of posts in recent months, we have seen that Argentina is a market that is emerging in the panorama of world trade in wine, gaining positions to the detriment of Australia and the USA. We then saw that it is a nation where the weight of international grapes is relatively limited (21%) compared with other countries of the “new world” wine. We finally appreciated Argentina as one of the most competitive country to produce wine, thanks to a strong production potential and excellent positioning of its products in the world markets. And all these considerations can be seen when you look at the numbers in the sector in Argentina, which are very well highlighted by the local organisation. The data we show today leads to a further set of considerations: (1) the production potential is significant noting the wide portion still sold as must, (2) the quality potential is coming out with more than 60% of the vineyard dedicated to production of high quality products; (3) one of the weaknesses, the lack of powerful wineries could be partly solved by the increase in the average size of wineries; (4) finally, the Argentines have a clear idea about what they want to cultivate: Malbec, Cabernet Sauvignon and Bonarda. Produzione: 15m di ettolitri, circa un terzo della produzione italiana, stabile nel corso del 2007 (non ci sono ancora i dati del 2008). Almeno 6-7m/hl potenziali di ulteriore produzione di vino argentino sono oggi venduti come mosto e quindi non “contano” nella produzione argentina di vino. Potenziale produttivo: 23-24m/hl. 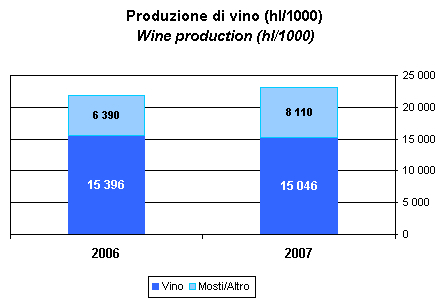 Products: 15m hectolitres, about one third of Italian production, stable in 2007 (still no 2008 data). There is at least 6-7m/hl of potential for further production of Argentine wine which is now sold as must and do not “count” in the production of Argentine wine. Production potential: 23-24m/hl. 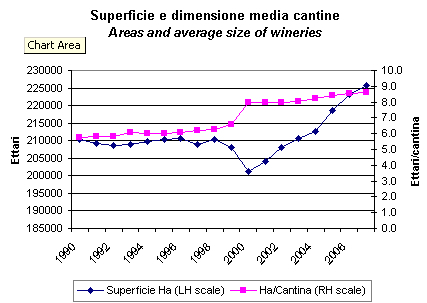 Andamento superfici: le superfici hanno preso a crescere dal 2000-01 e il settore si e’ consolidato (vedete il balzo nella dimensione media delle cantine da 6-6.5ha/cantina a oltre 8). 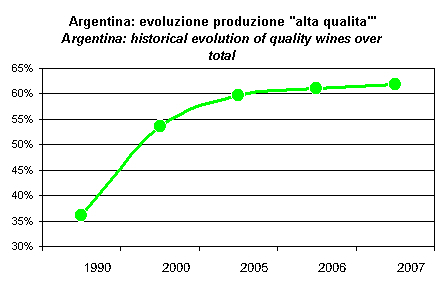 Questo e’ il periodo della crisi argentina: il cambio potrebbe avere aiutato l’esportazione di vino e quindi spinto operatori a dedicarsi alla produzione. Nel 2007, ci sono 226mila ettari di vigna di cui circa 211mila dedicati alla produzione di vino. 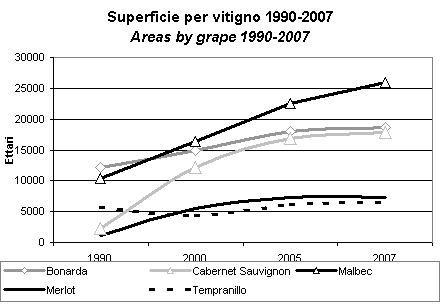 Trend of planted area: the areas started to grow from 2000-01 and the sector was consolidated (see the leap in the average size of wineries from 6-6.5ha/winery to over 8). That’s the period of the Argentine crisis: the exchange rate could have helped the export of wine and pushed operators to upgrade production. In 2007, there are 226k hectares of vineyard of which about 211k dedicated to the production of wine. Evoluzione della produzione: la tendenza all’abbandono dei vini rosati e alla crescita dei vini rossi continua anche nel periodo 2006-07, come avevamo visto nel 2005. Dei 211mila ettari, ormai 100mila sono dedicati ai vini rossi e solo 63mila ai vini rosati (contro 100mila del 1990). 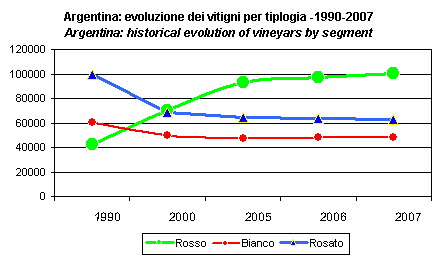 Evolution of production: the drift of rose wines and growth of red wines continued in 2006-07, as we saw in 2005. Of 211k hectares, 100 thousand are now dedicated to red wines and only 63k to rosé wines (compared with 100 thousand in 1990). Evoluzione qualitativa. La loro “alta qualita’” raggiunge ormai 130mila ettari su un totale di 211mila. Dal 2005 al 2007 la penetrazione e’ passata dal 60% al 62%. In termini assoluti, le superfici adibite a produzioni di bassa qualita’ sono passate da 82500ha a 80800ha, quelle di alta qualita’ da 122mila ettari a 130mila. Qualitative development. Their “high quality” areas are now 130000 hectares out of a total of 211000. From 2005 to 2007, the penetration rose from 60% to 62%. In absolute terms, the land used for production of low quality declined from 82500ha to 80800ha, the high-quality ones moved from 122k hectares to 130k.